For the whipped coconut cream you need a 200gr package of coconut cream and tablespoon of coconut sugar. Start with preparing the flax eggs. I used THIS recipe, so I mixed 2 spoons of raw flax seeds that I just ground, with 6 table spoons of water. The mixture should chill in fridge for at least 15mins up to 1 hour. The brownie mixture is just enough to fill 20cm (8″) pan, so prepare one and preheat the oven to 180*C (350* F). In a bowl whisk together the coconut oil, maple syrup, flax eggs and vanilla extract. In another bowl mix well the carob powder, almond flour, wholegrain flour, baking powder and salt. Mix dry ingredients with the wet until combined. Pour into the baking pan and smooth the top. Bake for about 30 mins. Serve with frosting or decoration of your choice. For whipped cream I used Cocomi coconut cream as it just needs to be chilled for couple of hours in the fridge and then whisked with a hand mixer. 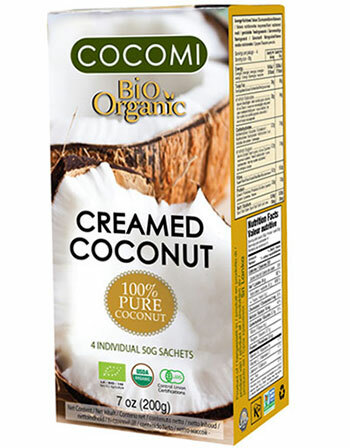 I added a spoon of coconut sugar and in just few minutes I got this creamy texture and delightful taste.